From Fashion Week to photo shoots, advertising campaigns to celebrity clients, makeup artist Caitlin Wooters keeps herself pretty busy. She began her career with Bobbi Brown and her career has since skyrocketed. Read on to learn more about how she first became interested in beauty, the makeup palette she can't live without and so much more. I am a smalltown girl living my dream in the Big Apple. Ever since I can remember, my family and I would go to New York for the US Open. We would stay at the Marriott Marquee in Times Square and I always loved the feeling I got when we walked those busy, glittering sidewalks. I was born and raised in Hockessin, Delaware and I’m the middle child of three. In 2005, I moved to New York to attend the Fashion Institute of Technology and majored in Photography. Going to FIT is what ultimately brought me to where I am today. Happy, married and working as a freelance makeup artist. I am my own boss and there's nothing more I could ask for ... except, maybe, for an agent. My mother always had some kind of makeup lying around. Whether it was in her closet, in her bathroom, in her purse or in her car, wherever she went she was wearing makeup and reapplying it too. I must have gotten my love of beauty from her. Around age 9 and 10, I remember using her products and taking selfies or singing to myself in the mirror. Once I became a little older (11, 12 and 13), I started doing fashion photo shoots with my girlfriends. We would get all dressed up, I would do the hair and makeup and we’d all take turns modeling and being the photographer (I still have these pictures at my parents' house). In middle school and high school, my friends would ask me to do their hair and makeup for parties and for dances. My dad would even tell me that he always loved how creatively I would style my hair! I always knew I was interested in beauty and I always liked taking photos too. So, I had to make a decision: cosmetology school or photography school. I chose photography. It was in photo school that I learned about light, about being on set, about Photoshop and about what a picture is going to look like as apposed to how the model looks in person. A year after graduating FIT, Martine Langatta, a best friend of mine from college who actually introduced me to my husband, asked me to do makeup and hair for a photo shoot. I, of course, said yes, knowing I could do it. What I also knew in that moment was that if Martine asked me to be the photographer, I wouldn’t have felt as confident or excited as I did about being the makeup artist. That was when I knew it was time to tell everyone I was pursuing makeup instead of photography. Once I started doing test shoots and really working to make a portfolio, my parents gave me a lot of makeup-related gifts to support my new dream the same way they supported my photography. One gift, The Makeup Manual by Bobbi Brown, is what eventually inspired me to get my first makeup job at Bobbi Brown Cosmetics in Macy’s Herald Square. Before that I was bartending and waitressing in Murray Hill until I met my husband who freed me of that lifestyle. Marc believed in my talents so much and completely supported my journey to becoming a freelance makeup artist. Without the help of my loved ones, I would not be where I am today. What are your top 5 favorite beauty products and why? Bobbi Brown BBU Palette. 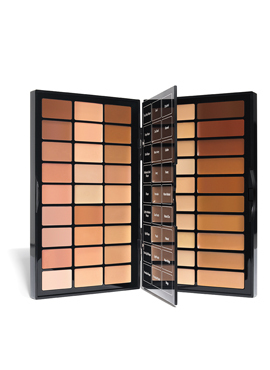 This pro palette has pink and peach correctors with yellow undertoned concealers and foundations. You can use a little or a lot to determine the type of coverage you want while still maintaining a natural skin texture and a perfect skin color. I am never fearful of not having the right colors because this palette has it all. Great for pros and the everyday woman. 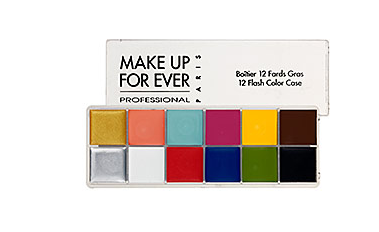 Make Up For Ever 12 Flash Color Case. This palette comes in handy often. If I need to make my own cream contouring color, my own eyeshadow color or my own lip color, I can. When I want to make anything avant-garde, I know this palette will allow me to create it. It has 12 richly colored paints in a creamy consistency so if you know the color wheel, you can make any color in the world! I use this often for eyes, lips and face. 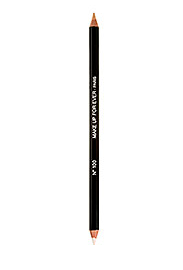 Make Up For Ever Concealer Pencil/Lip Liner Pencil in Ivory/Beige. When perfecting a lip or removing red from the eye’s waterline, this pencil always saves the day. It is double-ended so you have a light option and a medium option. No lip is perfect and if it is you will still need the liner to emphasize that in a beauty shot. 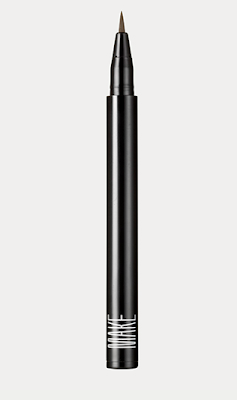 MAKE Brow Pen in Cool. This cool toned, marker-like brow filler has a small enough tip to mimic the size of actual hairs while also looking like a natural color and texture. I use this a lot for a polished, clean, natural look. It works with most brow colors. Hakuhodo G5521BkSL Highlight Brush Pointed. My favorite tool right now! This blue squirrel and goat hair brush blends powder and water based products flawlessly. I can’t imagine how I ever lived without it. 1) Protect your skin to perfect your skin. Wear SPF 30 every day on your face and body to protect your skin from the damaging and aging effects of the sun's UVA and UVB rays (SPF 50 can actually clog your pores). Reapply as needed. 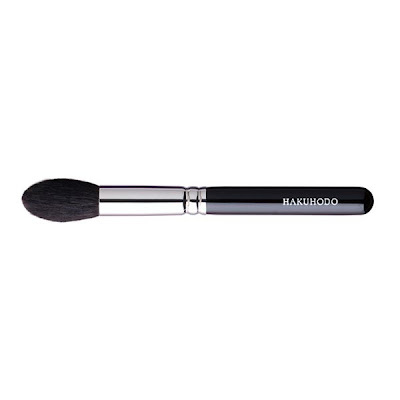 2) Clean brushes mean clean skin and clean makeup application. Wash your brushes as often as possible with a shampoo-like brush cleaner to avoid unwanted oils and/or bacteria on the face. 3) Bronze to correct. Always bronze the neck and face because they are usually whiter than the chest and body but we want all of that to match! I feel so lucky to be where I am in my career right now but I am also very lucky to have my husband, my kitty and my family and friends. We have family in New Jersey and Delaware so we try to visit them often. We also have a house in the Pocono Mountains where we retreat anytime we have available! It is here that we relax and go hiking or watch a VHS next to the fireplace. We take our cat for walks in the park, we let her climb trees and she travels with us whenever possible! As a freelance artist, however, I am constantly on the hunt for new ideas, the newest trends, what work can I get for next week, how can I update my portfolio, my website and my social media pages ... I basically work nonstop! So, my husband, who is an actor, has taught me how to take the little free time that I have and just run with it. So I try, but I’m a workaholic. Spare time is rare time so it's spent with loved ones and family! 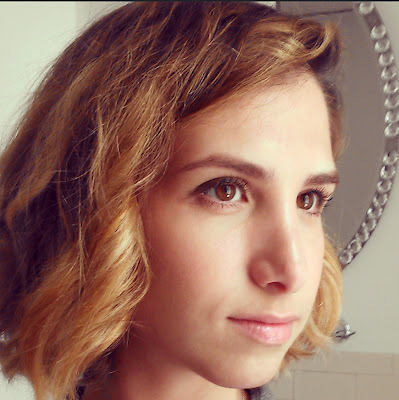 I love Bobbi Brown's style - making the most of your best features in a quiet, natural way. Caitlyn Wooters had a great teacher and she looks great. She'll go far in the beauty world!